The smallest body and scale length of the traditional ukulele family, also referred to as the "standard" size. The sweet, warm island sound of this instrument has surprising volume. Upper Bout Width - 5.125"
Lower Bout Width - 6.500"
Standard appointments include Honduras Mahogany soundboard, back sides & neck / Choice of Rosewood or Ebony for fingerboard & bridge / Bone nut & saddle / Black, white, ivoroid or tortoise bindings / Abalone or Mother-of-Pearl rosette & fingerboard inlay / Oasis Nylgut strings / Tie bridge / Padded Gig Bag. 12 frets to body, 16 frets total. The Concert is a is a step up in size from the Soprano with the same GCEA tuning. Many players find the wider fretboard and longer scale to be easier to play. The Concert can be set up for traditional "Island" or "Low G" tuning. 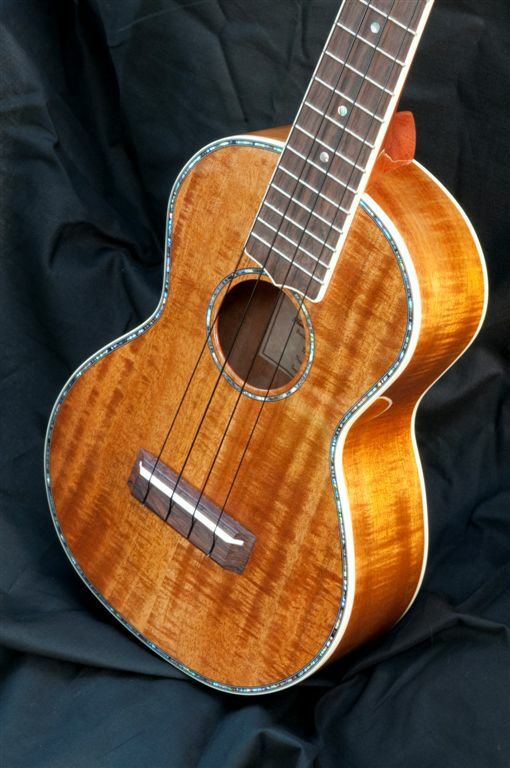 Standard appointments for the Koa Concert Ukulele include Flamed Koa soundboard, back & sides / Honduras Mahogany neck / Rosewood fingerboard & bridge / Abalone shell top & rosette purfling / Bone nut & saddle / Celluloid ivoroid or tortoise bindings / Abalone or Mother-of-Pearl fingerboard inlay / Oasis Nylgut strings / Pinless bridge / Hardshell case. 14 frets to body, 19 frets total. The Tenor size has become increasingly popular with "Low G" set up. Guitar players will find the Tenor to be an easy instrument to master. A Radiused fingerboard can be specified as a standard option. Body Style - Custom "Fat Body"
Upper Bout Width - 6.625"
Lower Bout Width - 9.000"
Standard appointments include Honduras Mahogany or Rosewood back & sides / Choice of Mahogany, Spruce, Cedar or Redwood top / Choice of Rosewood or Ebony for fingerboard & bridge / Bone nut & saddle / Black, white, ivoroid or tortoise bindings / Abalone or Mother-of-Pearl rosette & fingerboard inlay / Oasis Nylgut strings / Pinless bridge / Hardshell case.